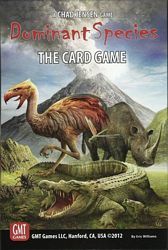 Dominant Species: The Card Game is a fast-playing game that abstractly recreates a tiny portion of ancient history: the ponderous rescinding of an ice age and what that entails for the living creatures trying to adapt to the slowly-changing earth. Players will use six major animal classes – mammal, reptile, bird, amphibian, arachnid or insect – to further their goals in various terrain. Through wily card play, players will strive to become dominant at as many different terrestrial and sea biomes as possible in order to claim valuable victory points: It is survival of the fittest. All of this leads to the end game – the final descent of the ice age – where the player who has accumulated the most victory points wins the game.